MIAMI – Experience the Mediterranean with a different perspective, and renew the spirit; clear the mind; and recharge the body on new Seven Seas Wellness shore and spa pairings. Announced in March 2017, Regent Seven Seas Cruises’ new holistic wellness program is now available for Seven Seas Voyager guests to reserve on this summer’s Mediterranean voyages. Seven Seas Wellness combines a refreshing, low-impact activity in 10 Mediterranean destinations with one of five revitalizing treatments in the onboard Canyon Ranch SpaClub. Provence (Marseille), France – De-stress and unwind with the ancient Chinese martial arts in a 19th century palace on Tai Chi in the Imperial Garden. Palma De Mallorca, Spain – Enjoy fresh sea air and breathtaking scenery as guests center their chi from either the Illuetta Bay or Can Antoni Pere Beach on Mallorca Meditation in Motion. Corfu, Greece – Experience Corfiot filoxenia, a concept not adequately defined by the word “hospitality,” and learn about local culture, before practicing yoga and deep meditation in one of Greece’s most beautiful estates on The Generosity of Spirit. Monte Carlo, Monaco – Guests will calm the mind, increase focus, strength, and stamina, in the fast-paced, dance-like style of yoga that synchronizes breathing, while enjoying the spectacular Mediterranean panorama on Vinyasa Yoga on Monte Carlo. Taormina, Sicily – Guests take in the dramatic and contrasting coastlines, cliffs, and Mount Etna, as they practice poses from a high perch overlooking the charming seaside town on Taormina Terrace Yoga. Rome (Civitavecchia), Italy – Soak in the restorative mineral-rich, thermal springs, which has been visited by Popes and Kings throughout its thousand-year-old history on Thermal Baths of Popes. Sorrento, Italy – Enjoy a sprawling spa complex built on the site of an ancient Roman prototype, consisting of warm and cold thermal springs with rock grottos, mineral baths, pools and genuine Roman sauna rooms on Roman Baths and the Burning Fields. Venice, Italy – Visit the exhibition at the palace-turned-museum, where one room recreates a 16th century perfumer’s laboratory and guests can learn how to create their own perfume to take home on Venetian Scents at Palazzo Mocenigo. Amalfi/Positano, Italy– Be inspired and invigorated by the island’s calming presence, inherent spirit, and many natural gifts on a highlights tour, before visiting Carthusia, the famous and exclusive perfume laboratory on this full-day Capri for all Senses. Palma De Mallorca, Spain – Enjoy the benefits of lower-impact, body-toning Nordic walk up the hill to the 14th century Bellver Castle on Nordic Morning Walk. Palamos, Spain – Unlock the many health benefits of this atypical Laughter Therapy session, where guests giggle and laugh for a full-scale workout to release stress-busting endorphins on the Wellness of Laughter. Ocean Scrub – A wonderfully restorative, exfoliating body treatment that cools skin on contact, while antibacterial essence of laurel opens the airways and spirulina intensely hydrates. World of Relief Body Buff – Organic essential oils from around the world combined with organic Dead Sea salts that stimulates and exfoliates, and is finished with an application of biodynamic honey and essential oils that hydrates and nourishes. Vitamin Infusion Facial – This superb treatment delivers nutrients to the skin to reduce the signs of environmental damage from the sun, pollution and stress. Sole Rejuvenation – This deliciously relaxing foot scrub and massage relieves tension, soothes aches and puts the spring back in your step. Tangle Me Up Organic Body Wrap – Powerful antioxidant compounds found in Laminaria digitata algae work to firm and tone the skin, alleviating the appearance of cellulite and signs of aging, while helping to protect against cell damage from environmental toxins. The new Seven Seas Wellness program on Regent’s Seven Seas Voyager is available on seven- to 10-night Mediterranean itineraries departing May 22 through September 28, 2017, except aboard the July 25, 2017 voyage, and select 2018 sailings. There is a supplemental charge of US$299 per guest per wellness experience and spa service pairing. Celebrating its 25th anniversary in 2017, Regent Seven Seas Cruises is an inclusive luxury cruise line with a four-ship fleet that visits more than 425 destinations around the world. Regent Seven Seas Cruises is currently undergoing a $125 million fleetwide refurbishment that will elevate the level of elegance found throughout the fleet to the standard set by Seven Seas Explorer, which entered service on July 20, 2016, and has since been recognized as the one of the most luxurious ships ever built. A leader in luxury cruising, the line’s fares include all-suite accommodations, round-trip air, highly personalized service, exquisite cuisine, fine wines and spirits, unlimited internet access, sightseeing excursions in every port, gratuities, ground transfers and a pre-cruise hotel package for guests staying in concierge-level suites and higher. Beginning in summer 2017, Regent Seven Seas Cruises also will include Business Class air for all intercontinental flights. For more information about Seven Seas Wellness, Seven Seas Voyager and Regent Seven Seas Cruises or to make a reservation, contact a professional travel agent, visit www.RSSC.com, or call 1-844-4REGENT (1-844-473-4368). Regent Seven Seas Cruises has just announced its summer 2018 through spring 2019 voyage collection, with 113 alluring itineraries aboard Seven Seas Voyager, Seven Seas Mariner, Seven Seas Navigator, and the newly launched Seven Seas Explorer. MIAMI – Regent Seven Seas Cruises has just announced its summer 2018 through spring 2019 voyage collection, with 113 alluring itineraries aboard Seven Seas Voyager, Seven Seas Mariner, Seven Seas Navigator, and the newly launched Seven Seas Explorer. These four luxury ships will call at some of the most fascinating destinations in the world, among which are 28 maiden ports and 23 breathtaking UNESCO World Heritage sites. Guests will immerse themselves in cultures, cuisines and traditions with the line’s free unlimited shore excursions on all voyages and through included three-night, pre- or post-cruise land programs on Asia and Africa sailings. Throughout, each staff and crew member delivers exceptional, personalized service to every guest, for which Regent Seven Seas Cruises is renowned. Regent Seven Seas Cruises’ summer 2018 through spring 2019 voyages are now open for reservations. Launched in July 2016 and recognized as the most luxurious ship ever built, Seven Seas Explorer returns to Europe for a second consecutive summer season in May 2018. The ship will sail throughout the Mediterranean, North and Baltic seas on seven- to 12-night voyages and make maiden calls at Portimao, Portugal; Lysekil, Sweden; and Bodo and Haugesund, Norway. Seven Seas Explorer then commences its maiden Africa season on two epic voyages that showcase the continent’s west coast, a 24-night, Lisbon (Portugal)-to-Cape Town (South Africa) itinerary, followed by a 15-night, round-trip New Years voyage. The ship then heads west to South America for its vibrant rhythms, colors and cultures as it rounds the horn to Los Angeles via the western coast. Seven Seas Voyager also will sail the Mediterranean in summer 2018, with many seven-night itineraries that include calls at some of the region’s most chic destinations, as well as maiden calls at Korcula and Hvar, Croatia; Saint-Raphael, France; Lipari, Sicily, Italy. The ship will winter in the Caribbean, alternating seven- to 12-night, Eastern and Western Caribbean itineraries, which travelers can combine to immerse themselves in the region. New Caribbean ports-of-call for the line are picturesque Port Antonio, Jamaica, as well as Charlestown, Nevis, the birthplace of U.S. Founding Father Alexander Hamilton. Seven Seas Mariner will offer a variety of adventures throughout the Pacific, starting with Alaska in summer 2018. The ship then charts the South Pacific in the autumn to Asia and Australia, presenting the grand cities and historic, cultural landmarks of the Pacific Rim and Southeast Asia, and calling at Broome, Australia, and Oarai, Japan, for the first time. From Sydney, travelers can join Seven Seas Mariner on the Grand Aussie Adventure, a new 36-night circumnavigation of the continent, sailing Dec. 15, 2018. Regent Seven Seas Cruises’ most intimate ship, Seven Seas Navigator, will offer three very distinct programs, starting with an 89-night, Grand Arctic Splendor voyage that begins and ends in New York. The Grand Artic Splendor voyage is comprised of six sailings that call at 63 non-repeating destinations in Canada and New England, Greenland and Iceland, North and Baltic Seas, as well as into the Arctic Circle to reach the White Sea. On this adventure, Martha’s Vineyard, Mass., and Archangel, Russia, will be maiden ports. The ship will then sail a range of unforgettable Canada and New England cruises between New York and Montréal to showcase the autumn foliage and exciting cities of Quebec and the Northeast U.S.
To kick off 2019, Seven Seas Navigator will embark on Regent Seven Seas Cruises’ 13th World Cruise, an epic 131-night adventure that calls at 62 unique ports across the Hawaii Islands, French Polynesia, Australia, Asia and the Mediterranean. Regent Seven Seas Cruises’ 2019 World Cruise is comprised of seven distinct itineraries, calling at 23 UNESCO World Heritage Sites and making maiden calls at Kingfisher Bay (Fraser Island), Australia; Makassar (Sulawesi), Indonesia; and Puerto Princesa, Philippines. Celebrating its 25th anniversary in 2017, Regent Seven Seas Cruises is one of the world’s most inclusive luxury cruiselines with a four-ship fleet that visits more than 425 destinations around the globe. Regent Seven Seas Cruises is currently undergoing a $125 million fleetwide refurbishment that will elevate the level of elegance found throughout the fleet to the standard set by Seven Seas Explorer, which entered service on July 20, 2016, and has since been recognized as the most luxurious ship ever built. A leader in luxury cruising, the line’s fares include all-suite accommodations, round-trip air, highly personalized service, exquisite cuisine, fine wines and spirits, unlimited internet access, sightseeing excursions in every port, gratuities, ground transfers and a pre-cruise hotel package for guests staying in concierge-level suites and higher. Beginning in summer 2017, Regent Seven Seas Cruises also will include Business Class air for all intercontinental flights. For more information about Regent Seven Seas Cruises or specific itineraries, contact a professional travel agent; visit www.rssc.com; or call 1-844-4REGENT (1-844-473-4368). Royal Caribbean International took delivery of the newest addition to the cruise line’s fleet, Quantum of the Seas, from Meyer Werft Yard. 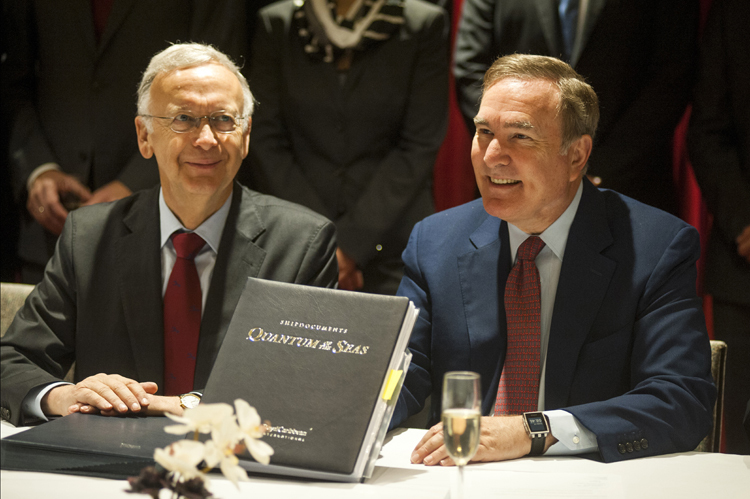 Royal Caribbean Cruises Ltd.’s Chairman and CEO Richard D. Fain and Meyer Werft Yard’s Managing Partner Bernard Meyer attended the official signing ceremony in Bremerhaven, Germany. With Captain Srecko “Felix” Ban at the helm, the ship sailed to Southampton, U.K., where she welcomed her first guests on November 2, for a trans-Atlantic voyage to her home port of Cape Liberty Cruise Port, Bayonne, New Jersey. Quantum-class ships are the world’s most technologically advanced in the world with “boatloads of bandwidth” which allow the cruise line to offer unprecedented connectivity – 500 times more than any other cruise ship; easy-to-use systems that expand guest choices and simplify schedules, plus, RFID technology that speeds up the boarding process and allows guest to track their luggage every step of the way. The ships offer new unprecedented features, such as RipCord by iFLY, the first skydiving experience at sea; the North Star, an engineering marvel that transports guests more than 300 feet above the ocean; SeaPlex, the largest indoor sports and entertainment complex at sea with bumper cars, roller skating and more; as well as the Bionic Bar powered by Makr Shakr which features the world’s first robotic bartenders. The ships also showcase the cruise line’s largest and most advanced staterooms ever, including the industry’s first-ever staterooms with Virtual Balconies, which offer expansive, real-time views of the ocean and exciting destinations from every interior stateroom. Quantum-class ships span 16 guest decks; encompass 167,800 gross registered tons; carry 4,180 guests at double occupancy; and feature 2,090 staterooms. For more information, visit www.RoyalCaribbean.com/QuantumoftheSeas. Fans and enthusiasts are invited to follow Quantum of the Seas’ through daily webisodes on RoyalCaribbeanPressCenter.com and also by following @RoyalCaribPR on Twitter. Whether cruising to Tahiti or Tanzania, Argentina or Antarctica, celebrating the winter holidays at sea is a very special way to get away with family and friends. Go where few will ever venture. Have a winter wonderland Christmas as Seabourn sails to Antarctica for the first time this fall. On December 11, the Seabourn Quest 24-day cruise departs from Santiago, Chile, sailing to Buenos Aires, Argentina, with a Christmas Day landing on the “White Continent”; enjoy two days at South Georgia Island, with its vast rookeries of king penguins and other seabirds, as well as breeding elephant and fur seals. Crystal Cruises’ new 17-night Antarctica cruise on the Crystal Symphony, departs December 21, visiting Argentina, Uruguay, Chile, Falkland Islands, Drake Passage, Cape Horn and the Chilean Fjords, offering chances to fly, hike and zodiac over and on the icy continent and to view the gorgeous glacial scenery of both King George and Ardley Island. Celebrate ancient traditions. Holiday markets, with hand-crafted toys, crafts and festive holiday food and drinks are a tradition dating back centuries and a special treat on many northern European cruises between November and January. Avalon Waterways invites travelers to spend Christmas in Prague and New Year’s in Vienna on its 9-day “Christmastime on the Danube” voyage departing December 25. Experience charming Christmas markets with AmaWaterways, which is offering four land-and-cruise itineraries on the Danube River, the Rhine and the legendary canals of Amsterdam. Uniworld Boutique River Cruises is offering seven holiday cruises ranging from 8 to 13 days, taking travelers along Europe’s great rivers. And Hurtigruten offers itineraries with a chance to experience Norway’s natural beauty and holiday traditions such as indulging in local foods, visits from “Norway’s Father Christmas” and the chance to see “The Northern Lights” of the Aurora Borealis. Discover delightful regional differences. Experience the holiday spirit—southern or Cajun style with American Cruise Lines. The seven-night “Historic South & Golden Isles” cruise, departing from Jacksonville, Florida on December 21, features a holiday décor tour of Charleston’s famous mansions and a traditional Sapelo Island holiday oyster roast on the beach, while the December 28 New Year’s Eve sailing, departing from Charleston, South Carolina, features fireworks over Savannah. The seven-night “Cajun Christmas” cruise on the Lower Mississippi River, departing from New Orleans on December 21, features Oak Alley Plantation in its holiday finery, Christmas Eve bonfires along the levee lighting the way for Santa and a traditional Reveillon-style feast. Or celebrate Christmas and New Year’s in Hawai`i with hula and ukuleles on Norwegian Cruise Line’s Pride of America seven-day Hawai`i cruise, departing December 21 and December 28 from Honolulu. Find serenity on the South Seas. A seven-night Tahiti & the Society Islands voyage with Paul Gauguin Cruises onboard the m/s Paul Gauguin departs on December 21 and features a holiday celebration while the New Year’s voyage, departing December 28, picks up the tempo with rock ’n’ roll classics, jazz and original compositions played by musician Robert Thomas as well as a lecture and wine tasting led by vintner Judy Jordan of J. Vineyards & Winery. Holland America Line features in-depth cultural experiences as part of its new fleet-wide “On Location” immersion program on a 28-day “New Zealand and Pacific Treasures Collector Holiday” cruise on the ms Oosterdam departing December 8 from Sydney that explores New Zealand, Fiji and New Caledonia. Experience exotic Asia and beyond. A 14-night Myanmar, Malaysia and Sumatra voyage with Azamara Club Cruises departing December 23 from Singapore combines a festive Christmas at sea with exotic ports and a relaxing New Year’s Day on the beaches of Phuket, Thailand. SeaDream Yacht Club offers a seven-night journey departing from Singapore on December 21 on its elegant mega-yacht SeaDream II, featuring golfing, diving and beach time. Oceania Cruises’ 30-day Lands of Grandeur sailing aboard Nautica departing on December 8 from Dubai visits ports in Oman, India, the Maldives and Seychelles as well as Kenya, Tanzania, Madagascar, Mozambique and South Africa. Home for the holidays. Why stay at home when CLIA-member cruise lines are bringing the holidays to you onboard? Each in its own way, cruise ships are incorporating the traditions and décor of Christmas, Hanukkah, Kwanzaa and New Year’s Eve into décor, dining and activities. For example: Carnival Cruise Lines has occasional “snowfalls” in the ships’ atriums, Regent Seven Seas Cruises is known for its magnificent gingerbread house displays, American Cruise Lines has ornament making as well as gift giving and Celebrity Cruises will hold pre-Christmas trunk shows in its boutiques, which are tax-and duty-free. Starting with November 9 departures, Disney Cruise Line’s “Very Merrytime” Cruises feature a “deck the deck holiday party” with Disney friends. In addition to holiday themed entertainment, many cruise lines offer special concerts, caroling and festive receptions as well as religious services. Princess Cruises features a tree lighting ceremony and a holiday themed variety show. For families, most lines feature special holiday crafts sessions, parties for kids along with visits from Santa and surprise gifts. ‘Tis the season to book early. Many cruise lines offer early booking specials and discounted pricing on select holiday cruises. For instance, for bookings through December 31, Oceania Cruises offers 2-for-1 cruise fares, free airfare from 26 North American gateways and bonus savings up to $4,500 per stateroom and Uniworld Boutique River Cruises is waiving or reducing its single supplement on select holiday cruises to make your Christmas vacation even merrier. For expert advice, travelers can turn to a CLIA Cruise Agent, who stays current on the latest offerings and trends and is an expert in helping clients select a cruise of their dreams. To find a CLIA Cruise Agent or Agency in your area, visit www.cruising.org and click on Vacations and use our Cruise Expert Finder. Variety Cruises is offering nine sailings of The Treasures of Costa Rica and the Panama Canal, a seven-night cruise from Los Suenos, Costa Rica to Cartagena, Columbia, from December 2013 – March 2014. Sailing on the Mega Yacht Variety Voyager, travelers will cross the celebrated Panama Canal while enjoying a harmonious balance between conventional cruising and private yachting. The cruise travels the Pacific Ocean coast line of Costa Rica with stops at the Corcovado National Park in Drake Bay, Manuel Antonio National Park in Quepos, the protected area of Golfo Dulce, the UNESCO World Heritage Site of Isla Coiba and the San Blas Archipelago. Cruise-goers will have the opportunity to explore a new port of call each day. In Quepos, white sand beaches are backed by a jungle sheltering hundreds of fascinating plant, mammal and bird species. Golfo Dulce offers sensational botanical gardens and orchid viewing, while Granito de Oro is a swimmer and snorkeler’s paradise. Fans of engineering will marvel at the Panama Canal as the Voyager sails through the Canal’s three sets of locks, connecting the Atlantic and Pacific Oceans. On Panama’s San Blas Islands, travelers will meet the indigenous Kuna community and learn about their customs, dances and way of life. The 36 cabin Variety Voyager, launched in May 2012, complies with the most stringent SOLAS safety regulations. All cabins are equipped with individually controlled air conditioning, mini bars, flat screen TV’s, DVD players and all the amenities of a luxury ship. The Treasures of Costa Rica and the Panama Canal sails from December 2013 through mid-March 2014, with rates ranging from $2,590 – $5,990 per person, depending on cabin category. Travelers who book their cruise by August 31, 2013 will receive a 25% reduction on cruise fares when they mention “Special Offer 2013 B.” (The offer does not apply to existing bookings and cannot be combined with other special offers). Variety Cruises 2013 brochures and flyers are now available by calling 1-800-319-7776. For more information, visit http://www.varietycruises.com/ . Variety Cruises, one of the world’s largest small ships cruise companies, has been offering passengers worldwide a total yachting experience since 1949. Their fleet of 11 fully-owned vessels varies in size from 4 to 36 cabins. Their yachts and staff provide an intimate and relaxed environment; a comfort filled starting point for the discerning travelers as they visit well known and unique ports of call. Fine locally-flavored cuisine, exciting itineraries and personalized service are just a few of the things that have made Variety Cruises the choice for the ever growing number of travelers looking for distinctive small ship cruise experiences. 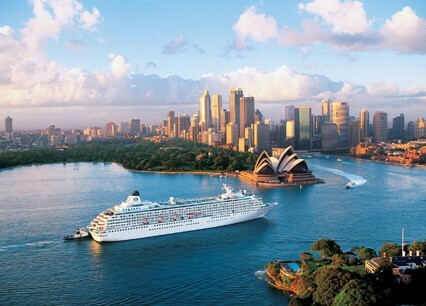 Crystal Symphony in Sydney, Australia. This summer, savvy travelers can save big on Crystal’s fall, winter, spring even next summer cruises. Compelling Book Now promotions – available through August 30 — are promising fares as low as $1,520 per person for a “Crystal Getaway” to savings as high as $8,710 per person for a World Cruise. Five- to 89-day applicable voyages offer intriguing choices throughout Crystal Serenity and Crystal Symphony’s autumn Mediterranean, Caribbean/Panama Canal, New England/Canada, South America; winter Australia/New Zealand and Asia/Africa (including the 2014 World Cruise); and spring/summer European seasons. Come August 31, Crystal is promising that fares will rise on more than 30 cruises. · 2-for-1 Asia/Australia Air: Two can fly for the usual price of one between Asia/Australia and North America, with all the ease of flight handling and airport/ship transfers by Crystal’s expert staff. Example: To Singapore and back from Hong Kong (economy class) for just $2,100 per couple. · Book Now Fares: Save up to $3,800/person off already attractive low fares. · Crystal Getaways: Starting from only $1,520/person, shorter Crystal luxury options for time-strapped travelers. · Explorer Combinations: Enhanced discounts — up to 25% off — for combining select back-to-back voyages. · Reduced Solo Fares: Ultra-low 10% single supplements on solo occupancy staterooms offer savings of up to $1,750 and fares starting from just $2,995. · Kids Sail Free: Kids sail free in a third berth with two full fare adult cruisers. · Crystal Family Memories: Shipboard credits and other perks for family/friends groups of 6 or more – plus a free berth when the group expands to 10. · World Cruise Savings: Everyone can now save $3,800 off the full 2014 World Cruise; repeat Crystal guests can save an additional $4,910, while even new-to-Crystal cruisers can enjoy additional savings of $3,930. · BONUS Share the Experience: Guests referring and sailing with someone new-to-Crystal can earn $400 shipboard credit per referred guest (up to $1600 total). · Early Payment Savings: Save an additional 2.5% by paying in full 180 days prior to sailing. · Double Crystal Society Savings: Returning Crystal guests can enjoy double Crystal Society savings of up to $1,380 per person. Royal Caribbean International’s Brilliance of the Seas has reemerged from a $30 million drydock ready to WOW guests. The 2,100 guest ship will now offer vacationers signature Royal Caribbean amenities first introduced aboard Oasis-class ships including five new dining concepts, an exhilarating aerial entertainment experience and technology advancements allowing guests to stay more connected than ever before. Brilliance of the Seas will debut her newest innovations this summer as she sails from Harwich, England, offering Northern European itineraries that visit some of the Baltics’s most sought after destinations such as Copenhagen, Denmark; Stockholm, Sweden and Helsinki, Finland. Doubling her dining options, Brilliance of the Seas now offers guests a wide variety of culinary experiences from family-style festivity at the Italian trattoria, Giovanni’s Table, to the intimate and exclusive multi-course Chef’s Table. Guests can expand their palettes at a multitude of other dining venues including Royal Caribbean’s signature Izumi Asian Cuisine, Park Café and Rita’s Cantina. In addition, the five-story Centrum – which is the focal point of the ship – has been transformed into a spectacular new space featuring the Centrum experience, which includes the addition of the 60’s-inspired R Bar as well as a multitude of entertainment experiences including enriching daytime activities, dazzling nighttime entertainment and a new high-flying entertainment experience where aerialists glide through the vertical space of the atrium. The ship also features a new location for the Concierge Club for suite guests, a Diamond Club for Crown & Anchor Society loyalty program members, a new English pub and the popular Royal Babies and Tots Nursery giving parents more opportunities to enjoy the ship’s amenities with peace of mind that their babies are being tended to by qualified care givers. Guests also will find that staying connected at sea will be easier with Wi-Fi access throughout the ship and enjoy a host of technology enhancements that include flat-panel televisions in all staterooms, an outdoor LED movie screen on the pool deck, as well as an interactive digital way-finding system. Old favorites such as the self-leveling pool tables, the adults-only Solarium and the Vitality Spa and Fitness Center can still be found onboard and are sure to delight guests of all ages. Brilliance of the Seas’ Northern Europe season includes eight sailings that offer the best of the North and Baltic seas, calling at Copenhagen, Denmark; Stockholm, Sweden; Helsinki, Finland; Talinn, Estonia; Gothenburg, Sweden; and offering an overnight in St. Petersburg, Russia. An 11-night Norwegian Fjords and Iceland itinerary, sailing July 27, will call at Bergen and Geiranger, Norway; Lerwick/Shetland, Scotland; Klaksvik, Faroe Islands; with an overnight in Reykjavik, Iceland. Brilliance of the Seas departs for Boston, Mass. on August 31 on a 15-night itinerary, calling at Paris/Normandy (Le Havre), France; Portland, Dorset, UK; Cork (Cobh) and Dublin, Ireland; Klaksvik; with an overnight at Reykjavik. For more information, contact your travel agent or visit www.royalcaribbean.com. MSC Poesia during a visit to New York City. MSC Cruises, a leader in the Mediterranean market, has just added its 13th ship, MSC Preziosa, to its fleet © 2012 Karen Rubin/news-photos-features.com. MSC Cruises continues its rapid expansion with the announcement that the company has finalized negotiations with STX France and signed a contract to take over a 139,400-ton cruise ship following the termination of the agreement with the original owner. The new ship is named MSC Preziosa and will become the 13th addition to the MSC Cruises fleet, as well as the precious fourth vessel in the series of Fantasia-class ships, which include MSC Fantasia, MSC Splendida and the long-awaited MSC Divina. MSC Divina, the sister ship of MSC Preziosa, is currently having her final touches applied in the STX ship yard in St. Nazaire, France before her christening in May 2012. MSC Preziosa will offer 1,751 staterooms, 17 guest elevators – including a private elevator for MSC Yacht Club guests – and 14 guest decks. Guests will be able to enjoy four main restaurants, including two speciality restaurants, 21 bars, a casino, four swimming pools, including an infinity pool, 12 whirlpools, mini-bowling, a sports area with game courts, a Fitness Center, a children’s area and the MSC Aurea Spa. An exclusive feature of MSC Preziosa – and of all Fantasia-class ships – is the MSC Yacht Club. Privileged guests staying in the 69 exclusive MSC Yacht Club suites will be able to take advantage of the private sun deck which includes The One Pool & Bar as well as two whirlpools; and the spectacular glass-walled Top Sail observation lounge with amazing ocean views. Butlers provide assistance with luggage during embarkation and debarkation; unpack and pack guests’ belongings upon request; serve traditional English afternoon tea; arrange for fine cigars, wines and spirits; and make dining room reservations as well as reservations for MSC Aurea Spa services; coordinate ad hoc shore excursions; and even plan private parties. Forty-five percent of MSC Preziosa’s total construction is now complete, and her mechanical zones are 70% complete. The best, however, is yet to come! MSC Cruises will soon begin the fitting and furnishing of the 1,094-foot long, 124-foot wide ship and work its unique Mediterranean magic on turning MSC Preziosa into a stylish masterpiece and a perfect mix of advanced technology, elegance and exclusive services. Cruise guests who want to play their part in reducing carbon emissions can also relax in the knowledge that MSC Preziosa’s green features, including an advanced waste water treatment system (AWT) and advanced energy saving systems, with a focus on air-conditioning, will gain the same impressive industry-leading ecoship and cleanship credentials as her sister ship MSC Divina. MSC Cruises is a leading cruise company in the Mediterranean, South African and Brazilian markets and operates across the globe. Its modern fleet comprises eleven ships MSC Splendida and MSC Fantasia (the largest ships ever built for a European ship owner), MSC Magnifica, MSC Poesia, MSC Orchestra, MSC Musica, MSC Sinfonia, MSC Armonia, MSC Opera, MSC Lirica, and MSC Melody. 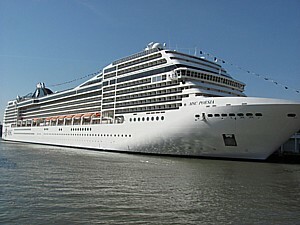 The fleet will increase in size with the addition of the MSC Divina which will be christened on May 26th, 2012 in Marseille, France. The fleet cruises year-round in the Mediterranean and seasonally in Northern Europe, the Atlantic Ocean, the Caribbean, South America, the Indian Ocean, South and West Africa, Abu Dhabi and the Emirates. MSC Cruises is the only company in the world to receive the “6 Golden Pearls” award from the Bureau Veritas in recognition of its high level of quality management and environmental responsibility. MSC has also achieved ISO 9001 and ISO 22000 certification for the quality and food safety of all aspects of its catering, both on shore and on board.